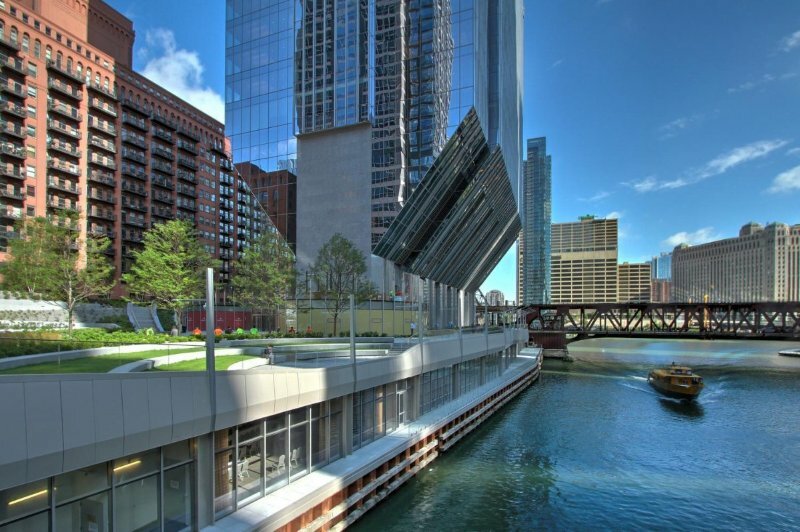 The large building’s Architect, Chicago based Goettsch Partners, www.gpchicago.com utilized an ingenious cantilever design to maximize the amount of office space above the small two-acre lot along side the high demand west bank Chicago river real estate. At the ENR Midwest 2017 Best Projects Awards ceremony Goettsch Partners’ high rise project was presented with multiple awards including the top honor “Project of the Year award”. The masterpiece was also recognized as Best Project in the Office/Retail/Mixed-Use category. Chicago, Illinois & Bethesda, Maryland based Clark Construction www.clarkconstruction.com completed work on the superstructure in 2017 and won a “Build America Award” for building this 54-story office tower with 1.2 million square feet of leasable space cantilevering off a concrete core enclosed in a curtainwall façade. 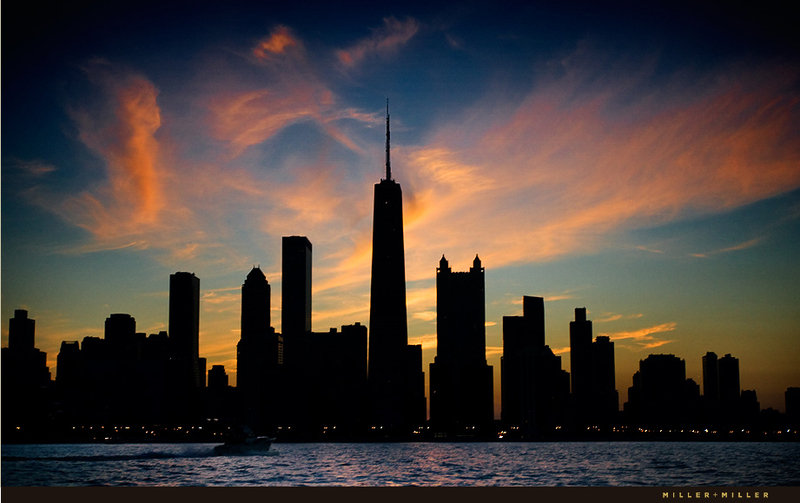 The developer for 150 N Riverside was Chicago, IL based John O’Donnell, Riverside Investment and Development Company. 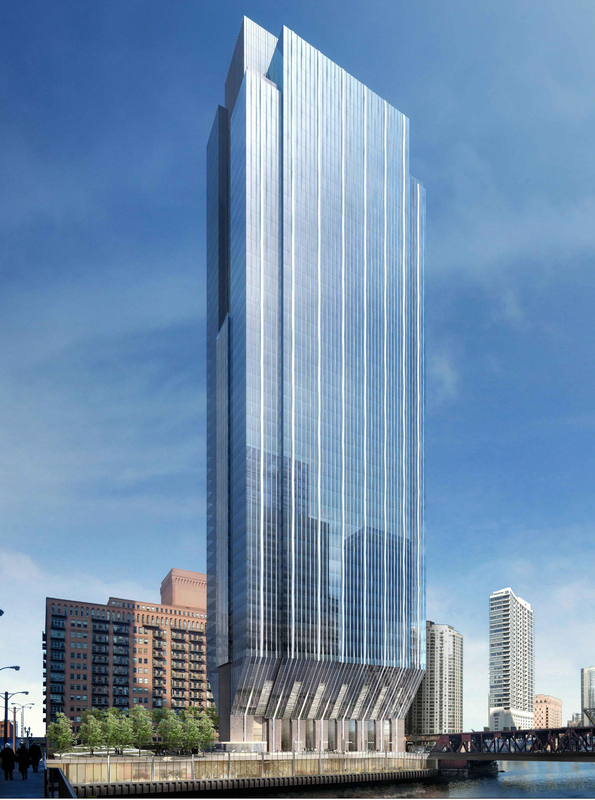 150 North Riverside boasts 1.2 million square foot ofClass A+ office development located in the dynamic West Loop submarket. 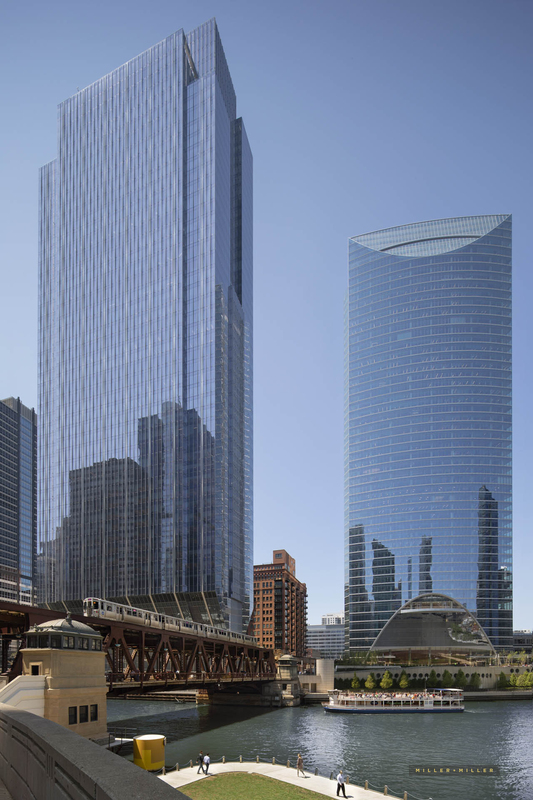 Located at the confluence of the three branches of the Chicago River, the Project offers a premiere location, convenient access to all major transportation systems, premium view corridors, large open floor plates and lobbies, and state-of-the-art building technology. 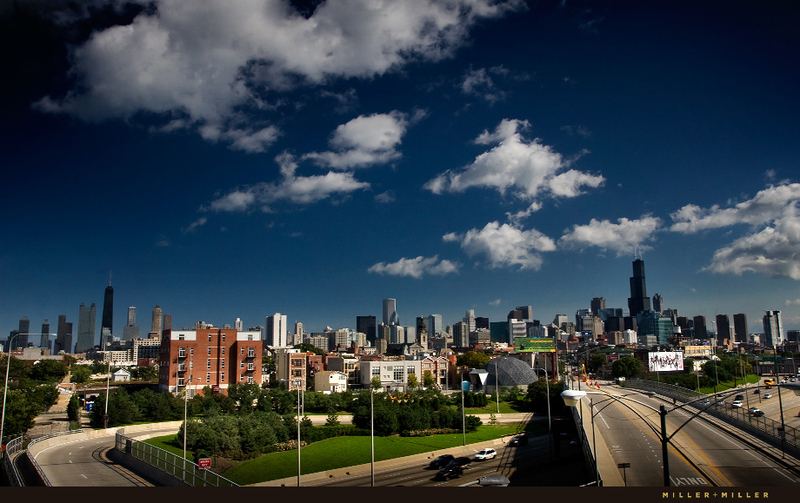 Situated in between Randolph and Lake St this transit oriented site is steps away from commuter and CTA rail lines. On-site amenities include a conference center, board rooms, a luxury restaurant, a 6,000 Square Foot fitness center as well as 100 valet and reserved parking stalls. 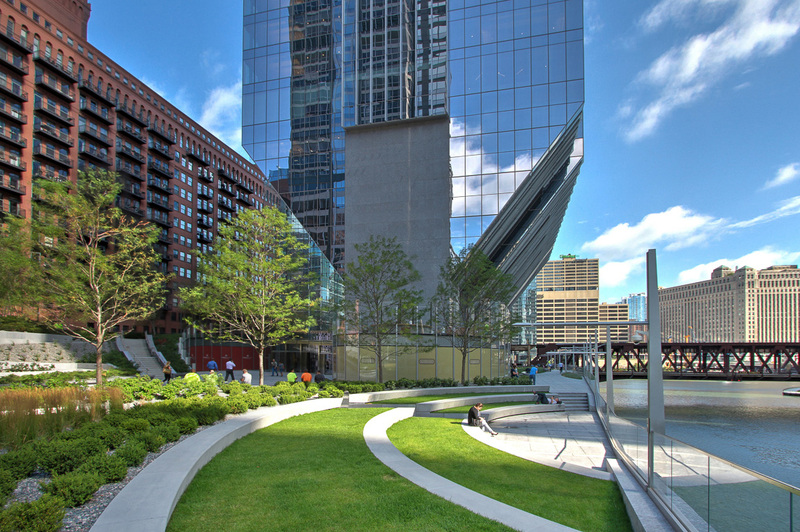 The Project delivers an unprecedented 1.5 acre landscaped public park at the base of the building as well as 360 feet of Riverwalk frontage. The modern architectural style utilizes a steel structure, concrete core construction, high performance floor to ceiling glass, 9’-6”clear ceiling height, and high end stone elements at the pedestrian level and lobbies. The iconic design has achieved LEED Gold pre-certification and features the most technologically advanced mechanical and building systems in the market. The structural engineer was Seattle, Washington based Magnusson Klemencic Associates. 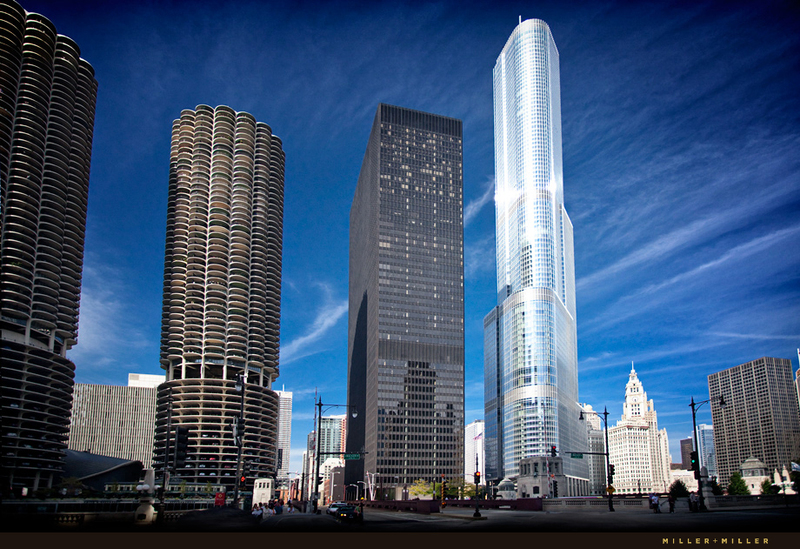 Class A office tower on an extremely challenging site adjacent to the Chicago River and active Amtrak rail lines. In response to the multiple site challenges, the building features an innovative, tapered superstructure design to create a footprint equal to just 25% of the tower’s floor area. Building accelerations are managed with 12 liquid mass dampers, and the project includes many innovations and engineering “firsts,” including the development of a thin concrete central building core structural system; use of the largest rolled steel sections in the world; design of a high-capacity primary foundation system using half as many support pilings; and many more. 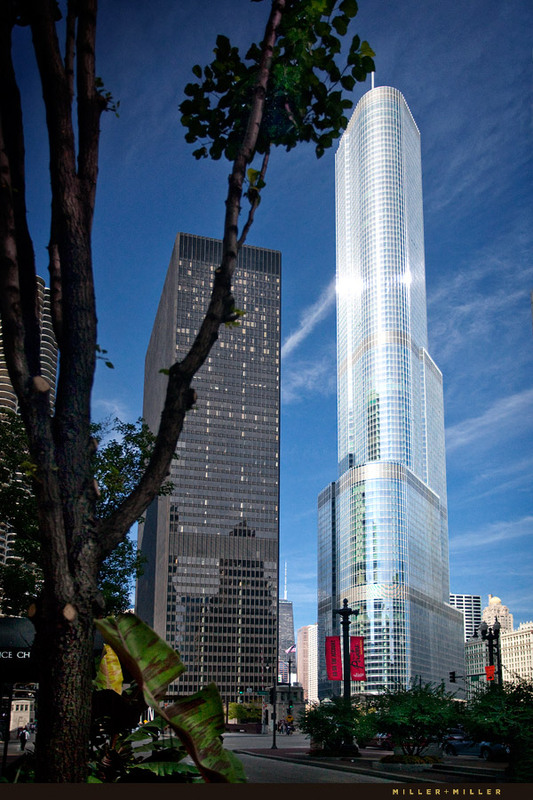 Awards include: 2016 Jurors’ Favorite/Most Innovative Structure, Excellence in Structural Engineering, Structural Engineers Association of Illinois, 2017 Building Team Award, Platinum Award, Building Design + Construction, 2017 New Construction Chicago Over $55 Million Finalist, Chicago Building Congress Merit Awards. MILLER+MILLER specializes in High-rise Skyscraper Buildings Photography and much more.